On the last day of school this year, my AP U.S. History students put the finishing touches on a digital history project they had started in May, following their AP Exam. The collaborative project, on which students contributed individual parts, shared research tasks, and worked with online tools, was my first classroom foray into the digital humanities. The whole process, which from start to finish lasted about three weeks, had two primary goals: contribute something new to the historical community and create and share the work digitally. After explaining to students that new scholarship was typically derived from primary sources, I led the class in a series of small lessons and tasks that gradually resulted in original research findings. Albeit small, the project gave students an introduction to the digital humanities and gave them the opportunity to collectively practice the work of historians. Their efforts resulted in Federalists and Antifederalists in New Hampshire. To begin, students were made aware of text mining as a methodology that can be used to generate research ideas. Together, the class read a short intro to text mining and watched a few related YouTube videos, including Big Data + Old History, a snappy overview of how computer science and distance reading has changed historical analysis. Students later experimented with the concept of text analysis by pasting full web pages into the playful academic search tool Serendip-o-matic, which searches image libraries like Flickr by extracting keywords within large text. In preparation for the next part of the process, I generated three separate word-frequency text analyses based on three volumes of the State and Provincial Papers of New Hampshire, and had students estimate the time period associated with each word list. (I simply used an online text analyzer for the lists.) Once several students made accurate estimates, and the class could see events of the past reflected in the word lists, I had students run their own practice analyses using several different milestone documents in American History, including the Proclamation of 1763, the Marshall Plan, and the Federal Highway Act. When students explained to the class the extent to which their analyses produced expected results, word frequency seemed like a viable way to “read” a large collection of primary sources without really reading a large collection of primary sources. Twenty-nine volumes of the State and Provincial Papers, covering the years 1630-1800 and consisting of approximately 25,000 pages, were divided among the class and each student ran at least two text analyses. After time was spent evaluating the results, and after students also explored other books like Jeremy Belknap’s 18th-century History of New Hampshire, each student was asked to use several pieces of scrap paper to propose potential research topics to be shared in a classroom gallery. All proposals were considered, the most interesting were discussed, and in the end I steered the class in the direction of three possibilities: Indian problems in different regions of New Hampshire; border disputes among different towns; and the state’s role in ratifying the Constitution. Regarding the Constitution idea, the student’s actual proposal had addressed New Hampshire’s “hesitancy” in the ratification vote. 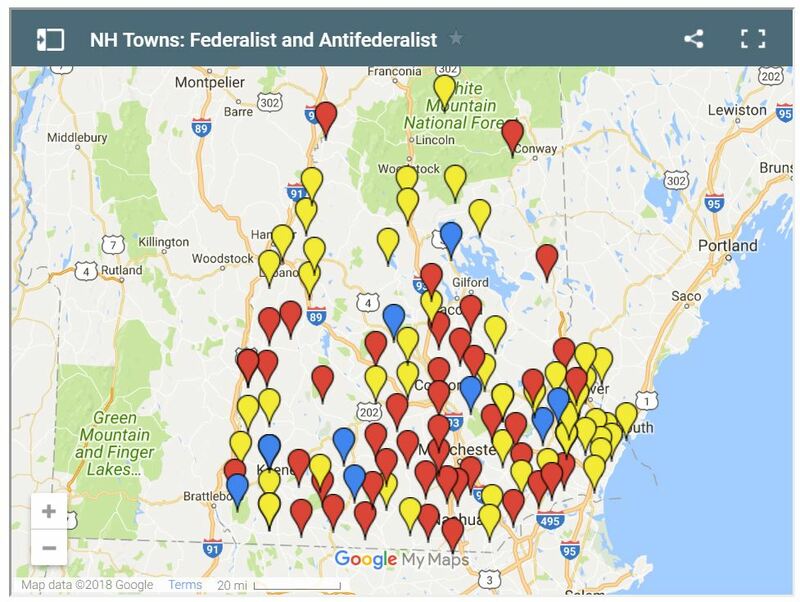 When this idea was investigated online, including Google Books and Google Scholar, analyses were found but it seemed that a town-by-town accounting of federalist and antifederalist sympathies was unavailable. Something like this ratification map of Massachusetts, in other words, was apparently not yet on the web. It was at this point that the final direction of the research project became clear. Inspired by interactive mapping projects, like this one on the Whiskey Rebellion, the class divided the work of compiling vote totals from the Journal of the Proceedings of the Convention of the State of New Hampshire Which Adopted the Federal Constitution, 1788. This data was inputted into a shared Google spreadsheet, zip codes were added, and everything was double-checked for accuracy. In front of the class, I went through the steps of uploading the sheet into a Google Map. The votes came to life as the map was color-coded and geographical patterns of support and opposition emerged. Data visualizations were completed individually by students using Plot.ly, an online graphing tool that allows for uploading spreadsheet data. Each student submitted at least one visualization and the best were included on the project website. While Plot.ly nicely presented data, DistanceFromTo.net greatly facilitated data collection. An online distance calculator, DistanceFromTo enabled students to easily measure the linear distance between key water ways and New Hampshire towns, and proved vital in proposing linkages between geography, economics, and the ultimate decision of New Hampshire residents to vote for or against the Constitution.